The 15 members of the ‘team’ organised by James Lake arrived on a fine Friday evening in April. Everyone settled in very quickly and set off to explore the gardens in the evening sun. Soon it was time for evening drinks in the Great Hall before supper where, in Kincardine tradition, they were introduced to the stories behind the portraits in the Dining Room. The stories included Guy Fawkes, Jane Austen, a hat, Alfred Brendel and, bizarrely, Tutankhamun all of which generated some conversation at supper, not that any incentive was required. In that most had driven all the way from the south we had very pleasant evening with bed-time at a very respectable one o’clock. Saturday morning dawned fair, as had been promised by the forecasters, and after a hearty breakfast we were joined by Jo’s mum Verity who took a team of five off to relocate snowdrops into the woodland garden. The remainder headed off to tidy up the drive-sides of numerous fallen branches and other woody debris. There was certainly no shortage of material and soon a large bonfire was blazing away on the East Drive. It had been a dry spring so far and the fires needed watching in case they spread. 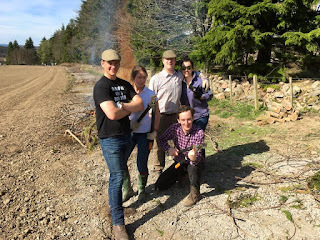 The bonfiring party was split into two and six of us set off with Land Rover and trailer to the West Drive to collect more material while the others stoked and tended the first fire. We soon realised that the task on the West Drive, to clear the ‘Stacking Lane’ used by the Royal Deeside Speed Festival of trees felled from the adjacent ditch, was far bigger a task than anticipated. A change of plan was called for. Leaving our two Wwoofers to tend the first fire we set off to start a new fire on the West Drive. Soon another huge and very hot bonfire was ablaze. The sun shone on us all day and it was hot work. We were thirsty workers by lunchtime and we gorged ourselves on delicious leak and tattie soup, STP and a selection of cheeses and fruit. Back to work the snowdrop team completed their work and we, in the fire team, completed the clearing of the stacking lane and the lower end of the West Drive using two teams each with Land Rover and trailer. By this time the wind had got up and this had caused the East Drive fire to spread rather further than intended. Happily the estate has a Fire Fighting trailer and the two man Fire Team went off to collect that. In the twenty-five minutes that it took to bring the Fire Engine on site and extinguish the extra fires which were heading in two directions – up and down the drive, the Land Rover and trailer team, clearly working to the max (or should that be Max), managed to turn the vehicle from heading east to heading west – a remarkable feat and proof that learning curves are sometimes vertical and having four people giving contradictory directions is generally counter-productive. Come 1630 hrs it was time to stop adding fuel to the fires and settle them to make certain they wouldn’t get out of control. The Fire Engine was used to damp down the perimeter of the fire and the occasional worker, tools were tidied away and we headed home – weary but well-satisfied with our day’s work. We got in just in time to grab a cup of tea and sit down to watch the Grand National. We had run a small sweep. Not knowing anything about racehorses I simply chose my horse by number – 38. It finished, which is better than the ones I usually pick. Soon it was time to change for dinner – black tie and masquerade being the dress code. I headed up looking for a nice long soothing bath to ease my weary limbs. It was not to be for the dear biomass boiler which is usually so relentlessly reliable had chosen to go out and what hot water there was had, by now been taken. A quick tepid shallow sloosh, more reminiscent of my sister’s house followed instead and I rushed off to re-start the machine. Drinks, canapés, photos on the long balcony, and more drinks were enjoyed before dinner. I had ordered a very fetching mask completely forgetting its incompatibility with my specs. Ah well. Dinner, speeches and afterwards singing, dancing, poems, stories followed in a blur. It was five minutes to three before I got to bed and I was asleep within minutes. This morning, Sunday dawned fair but a lot cooler than yesterday. On offer was more work or church parade and I think all but one came with us to church for Palm Sunday. Afterwards we all went down to Jo’s grave for a moment. Back up at Kincardine the table was laid up for the last meal. The team had been divided into three ‘watches’ to help with Dinner, Breakfast and Lunch and this seemed to work pretty well though at times there were many more helpers than those scheduled to be on duty. It was time for Bloody Marys or Virgin Marys to choice and lunch of roast chicken with delicious fattoush followed by pecan ice-cream in cones. All too quickly it was time to sign the visitors book and say our farewells. What fun it has all been. We wait with baited breath to see a wealth of snowdrops next spring; a considerable length of the drive is looking much tidier; various members of the group are now much more adept at reversing trailers; the smell from the overworked clutch will soon dissipate from my Landy; and the cellar can be refilled. All in all a very successful visit and a great way to help the Trust.